1. Kids love trains! Who knows why? Maybe it’s because of Thomas the Tank Engine, maybe it’s because they love the steam whistle and the smoke. It could be because they like looking out the window, jostling between cars, riding outdoors on the gondola car, playing on the caboose, or watching the countryside slip by at 12 mph. Whatever the reason, or maybe because of all of them, it’s a definite fact that kids love trains. 2. It’s a real, authentic, adventure. Of course, Disney World has a steam train. But not like this. The Cumbres & Toltec is the highest, longest and most authentic steam railroad in North America traveling 64 miles over trestles, through tunnels, on narrow ledges in a canyon, over high plains, through forests of aspen trees, and up onto a pass, high above timberline. It is the real deal, passing over the same tracks laid in 1880. 3. It’s off the grid. Tired of fighting the smart phone for your grandkids’ attention? That doesn’t happen on the Cumbres & Toltec. Because the tracks go where no roads go, there is very little development along the rail line – and as a consequence, no cell phone or internet coverage. You are out in the wilderness and can travel for hours without seeing a single manmade thing. 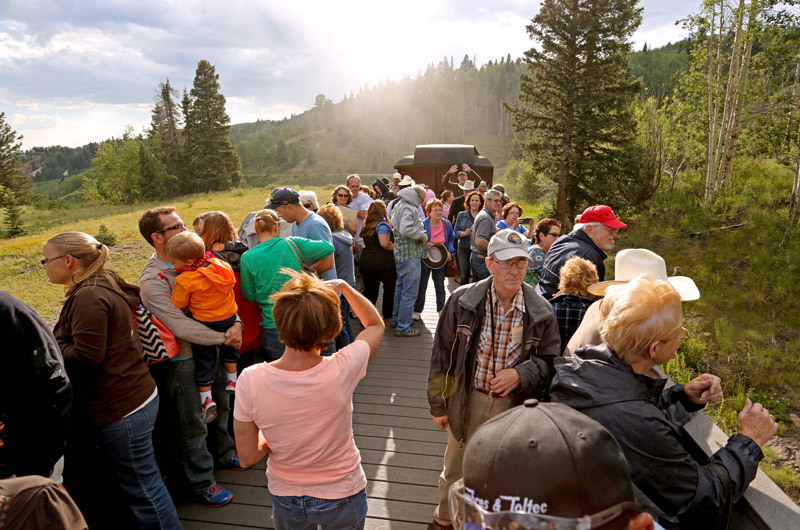 But of course, you will see pronghorn, elk, deer … and if you’re lucky, a bear. 4. It’s healthy and fun. A ride on the train is a day spent outdoors. You can ride literally outdoors on the gondola car or on the platforms between cars. Even in the cars, there’s no air conditioning. All the windows are open to let fresh Rocky Mountain air come streaming in, as the train chugs along at an average 12 mph. And don’t forget all full day rides come with a delicious, all you can eat healthy hot lunch. There’s a soup and salad bar, roast turkey or meatloaf, mashed potatoes, rolls – and all kids love the dessert bar. There’s also a bar car on the train, and restrooms in most of the cars. 5. It’s a piece of living history. 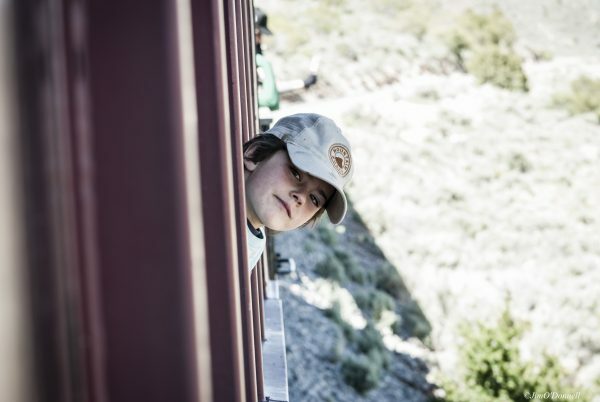 At a time where “history” is almost a bad word, the Cumbres & Toltec is an opportunity to show kids and grandkids what the world was like in the “old days,” when 12 mph was considered fast and railroads were a modern invention that revolutionized the world. The entire history of the West was dependent on railroads. Docents on the train will tell you about Wyatt Earp and Doc Holliday, who road the train, but also about the gold and silver the train carried, as well as the outlaws (one was hanged from one of the railroad’s bridges!) While your grandkids are having fun, they’ll also come away with a better understanding of the West. 6. It’s huge bragging rights on Facebook and social media. While they can’t post pictures on the train (there’s no cell or wifi coverage! ), your grandkids won’t be able to wait to post photos of themselves hanging on the train, posing in front of the locomotive, eating at the desert bar, riding on platforms between cars, and walking the railyards. This is a memory they will never forget. The Cumbres & Toltec Facebook page is filled with comments of people who remember riding the train as a kid, and now want to come back with their own kids. This true, authentic adventure is something your grandkids will always carry with them. And something you will remember as well. For convenience, there are nine different ticket packages to meet everyone’s time schedules. Check out our trip options to begin planning the trip of a lifetime for your family! 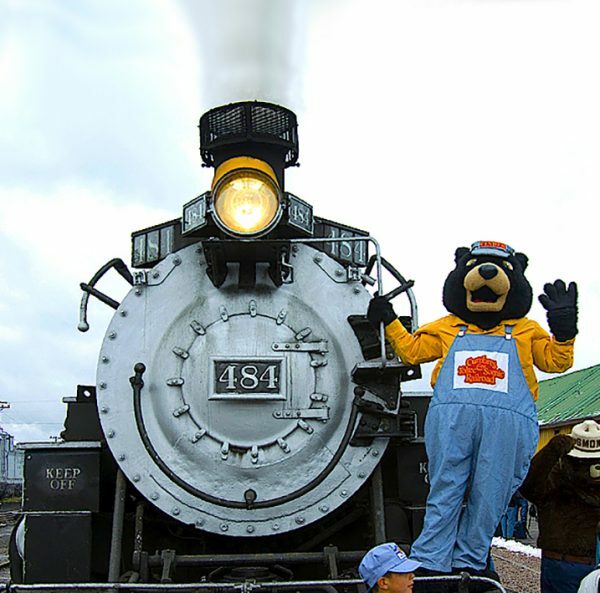 And if you have younger kids or grandkids, check out the Cinder Bear Adventure for a special half-day trip and lunchtime party with Cinder Bear, geared toward the little ones.